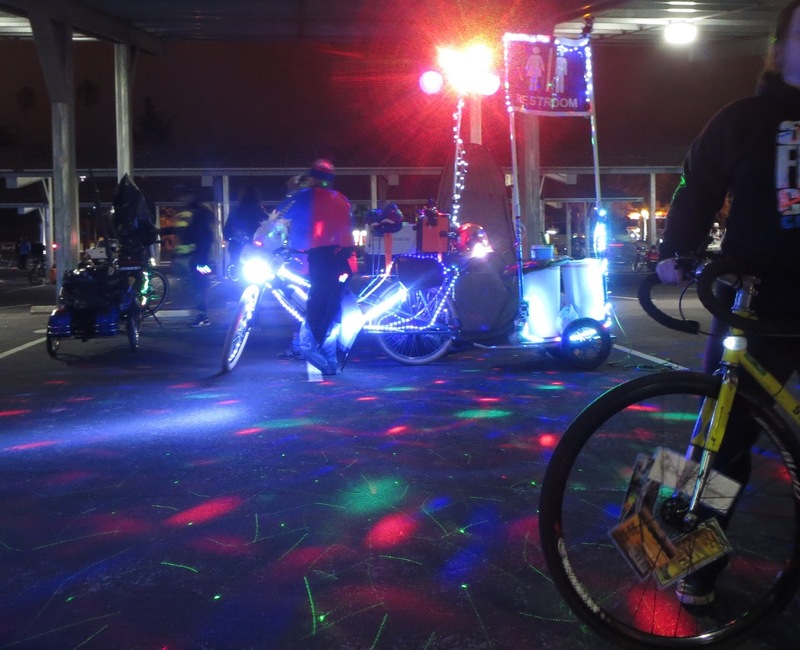 Last Friday I finally was able to participate in a San Jose Bike Party ride - the one with the superhero theme. And it was…and nearly two decades of wordsmithing for money are being deployed for this summary…fun. This wasn’t a random flash mob style ride: I could tell a lot of planning and actual work went into this. The reason I mention that is there were several superheroes scattered along the route to give directions if needed and several astonishingly good food trucks waiting for us partway through the ride. The only thing that went wrong is my cape wouldn’t billow behind my bike…but more details of my actual ride will soon be available as a post on the great UK bike light maker Blaze but for now be content to follow San Jose Bike Party on Facebook to get details of their next ride - I believe wearing pajamas may be involved. As the photo of my workshop above suggests: I am finally embarking on building a new cargo bike - that’s right, Bikeducken 2.0 is in the works - and if you are building something yourself or just want to see how talented people do it, head to the North American Handmade Bicycle Show in Sacramento this weekend. It is open from Friday to Sunday and looks like it’ll be a great place to get your imagination flowing or buy custom bikes yourself. Alex - the person who made the box bike I test rode last fall - will be participating in Climate Ride California 2016. Read up on what he is doing and why - then donate to his cause. So yesterday I learned Good Karma Bikes is a nominee for Best Bike Shop in the Metro’s ‘Best of Silicon Valley’ 2016 edition. If you’ve shopped there and think the place is a winner, click here to vote. Polls close on March 13th, so that means that if you have never shopped there before you have time to experience the shop for yourself and cast your ballot for Good Karma Bikes honestly. Also: they are having a parking lot sale this coming weekend so be sure to stop by 460 Lincoln Avenue in San Jose between 10:00am - 5:00pm on Saturday or between 11:00am - 3:00pm on Sunday. Hope to see you on and off the bike this weekend - hopefully on. Thanks for reading and thanks for riding.